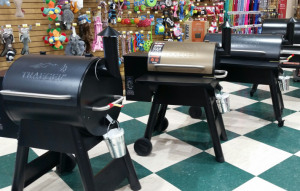 December Traeger Grill Bonus Kit Special! Stay off the naughty list this holiday season with a $100 value December Traeger Grill Bonus Kit Special! Through December 24, 2018, get a $100 value bonus supply kit with your purchase of any Traeger Pro Series 22, Pro Series 34, or Timberline grills from H&S Feed & Country Store. Three punches on the “Traeger Lucky 7” punch card – see details below. Pick up your “Traeger Lucky 7” punch card. Purchase 6 bags of Traeger pellets, get a bag of Signature Blend free. This entry was posted on Thursday, December 6th, 2018 at 6:04 pm	and is filed under Events, News & Updates. You can follow any responses to this entry through the RSS 2.0 feed. Both comments and pings are currently closed.